As every Cape Codder knows, we live in a beautiful and ecologically diverse place. But Cape kids often aren’t aware of the environmental riches that surround them and why they’re so valuable. 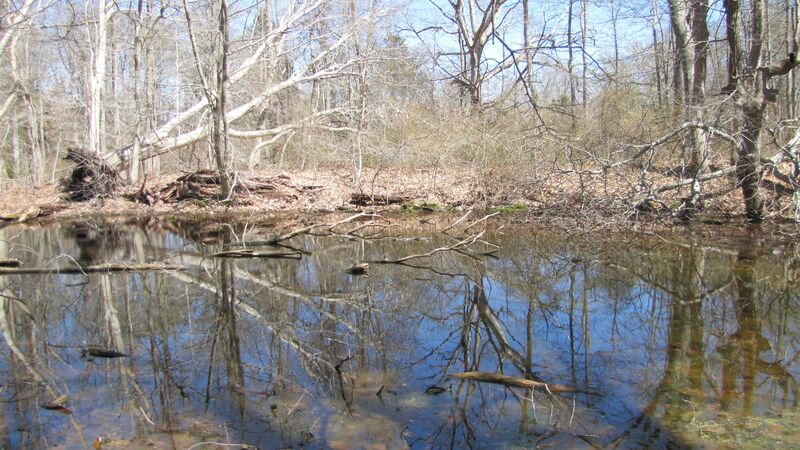 Vernal pool protected by the Brewster Conservation Trust. Vernal pools are critical to certain amphibians and invertebrates because they don’t contain fish that would consume their eggs. 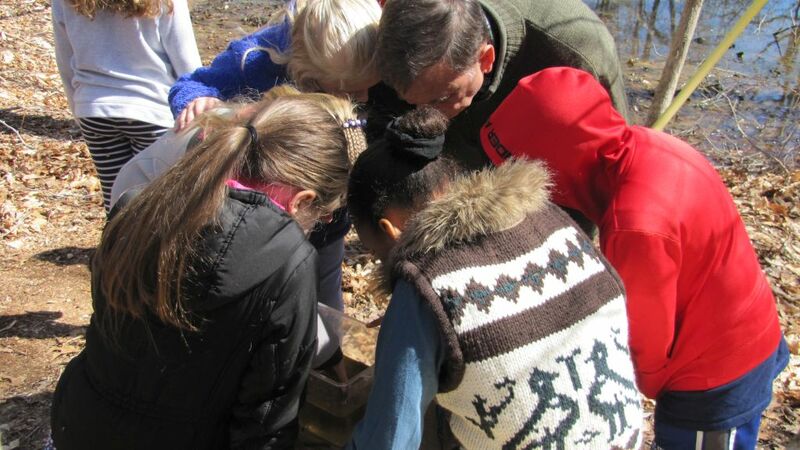 To help awaken students to the natural resources that abound in their backyards and to provide field sites for science learning, Wellfleet Bay, the Brewster Conservation Trust, and the Harwich Conservation Trust forged partnerships to offer extended programs in two local schools. The programs—in Brewster’s Eddy Elementary School and the Monomoy Regional Middle School, which serves Harwich and Chatham—include curricula that combine classroom lessons with engaging field experiences. Working with classroom teachers, Mass Audubon educators use the natural history of Cape Cod to teach concepts required by state science standards. 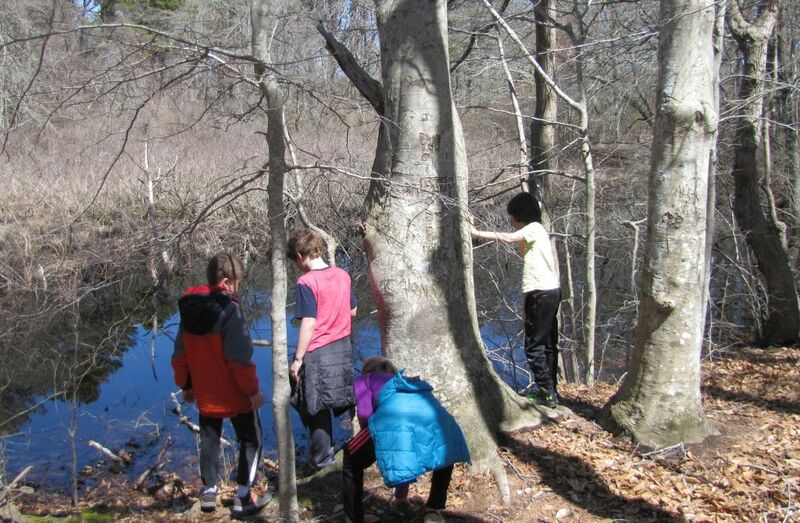 Eddy students have become familiar with the smooth gray bark of American beech trees that grow above the vernal pool. Before heading outdoors recently to explore the Brewster Conservation Trust’s vernal pools, Eddy Elementary School students learned what defines a vernal pool, the trees that make up the woodlands surrounding the pools, and the creatures that can be found there, such as the red-backed salamander. 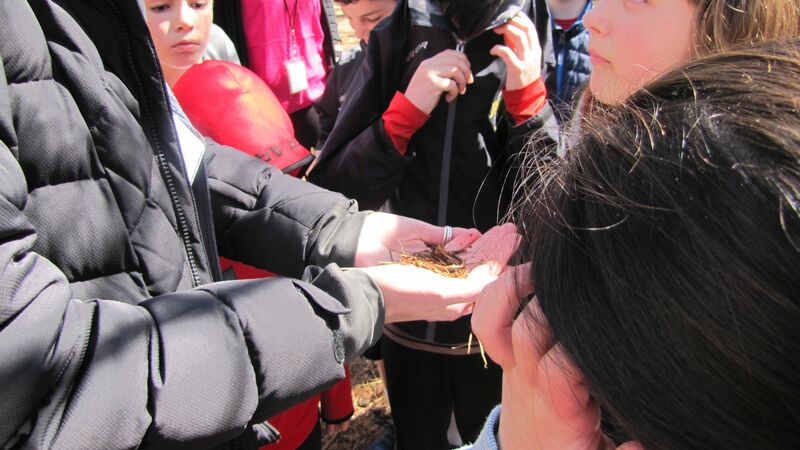 Wellfleet Bay educator Morgan Peck shows students how to hold a red-backed salamander on a cushion of leaf litter to protect its ultra-sensitive skin. Spotted salamander eggs and larvae have evolved to develop by mid-summer before the vernal pool gets too low or dries out. 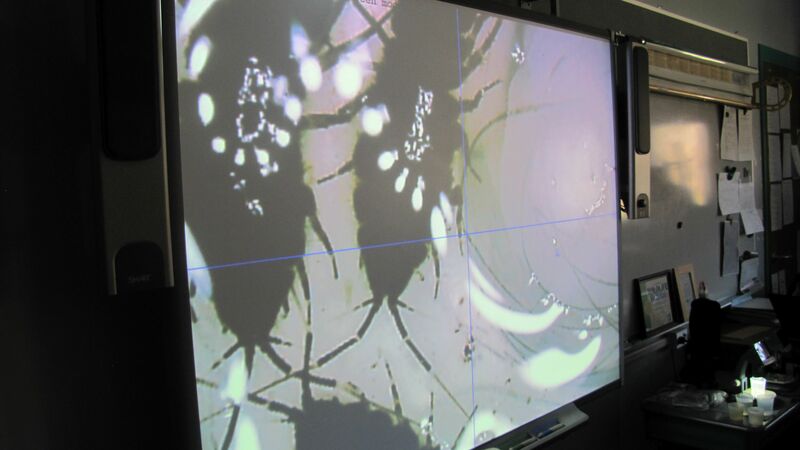 After the field work, students returned to their classroom with samples from the pool, some of which looked delightfully creepy when viewed under a microscope and projected onto a large screen. Macroinvertebrates like aquatic sow bugs are super-sized by microscope and large screen. For Monomoy 5th graders, the focus of learning was the Harwich Conservation Trust’s Cold Brook Preserve, once a commercial cranberry bog. The 66-acre Robert F. Smith Cold Brook Preserve in Harwich Port. 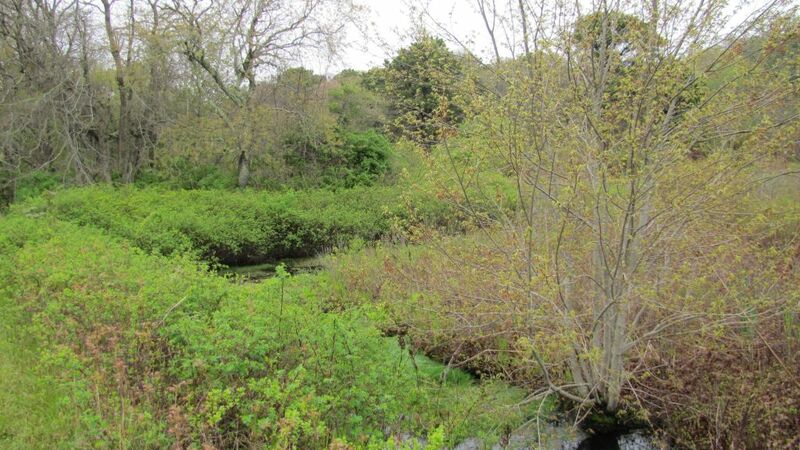 The brook flows into Saquatucket Harbor and Nantucket Sound. As with the Eddy students, the Monomoy program included classroom lessons about human-altered wetlands, the importance of restoring them, and the role healthy wetlands can play in offsetting the impacts of climate change. Then, the kids visited Cold Brook to conduct their own tests on water pH, turbidity, examine the tiny critters living in the creek, and released two juvenile American eels! Student scan a stream sample, which included aquatic sowbugs, caddisfly larvae, and the always popular freshwater leech! These species can serve as reliable indicators of water quality. Of course, when you’re in the field, the unexpected can happen. 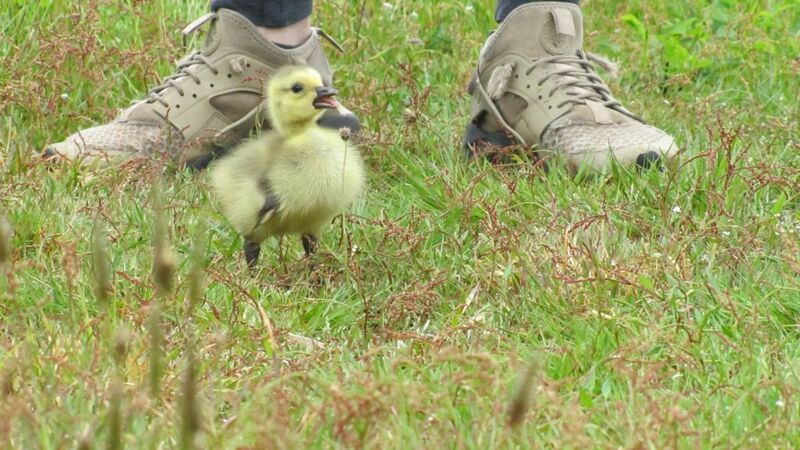 This unchaperoned Canada Goose gosling greeted the students, apparently in search of a parent. Harwich’s Cold Brook Preserve is full of new life in May! 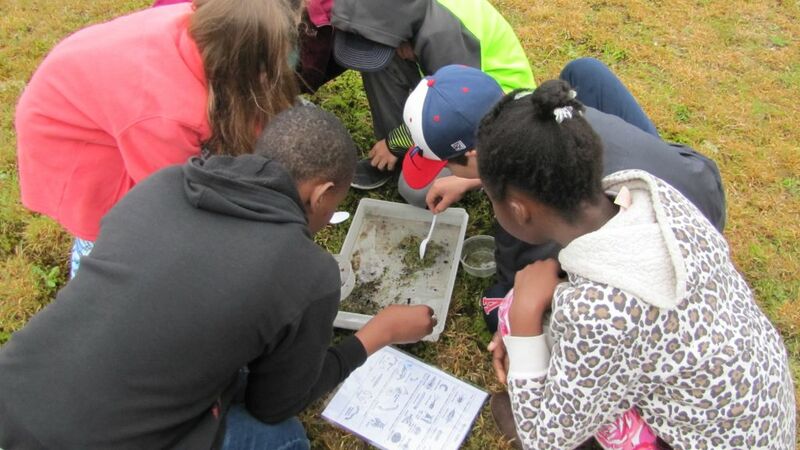 Wellfleet Bay school program coordinator Spring Beckhorn, who along with her colleague, Valerie Bell, developed lessons and activities, says the special field investigations make memorable what the students learned in the classroom. “Doing field work in special, ecologically important sites not only provides a hands-on educational experience. It connects students with places that we hope they’ll appreciate and want to protect as they get older,” Spring says. 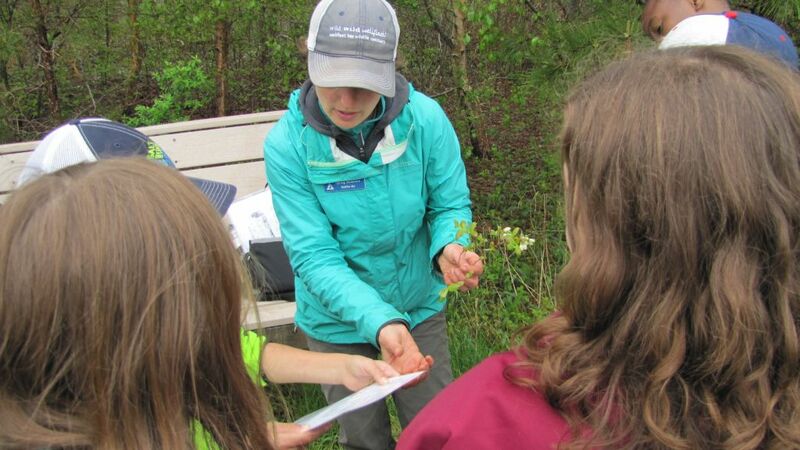 Spring Beckhorn holds a cutting of northern highbush blueberry, a plant that can indicate the presence of a wetland. Wellfleet Bay wishes to thank the Brewster Conservation Trust and the Harwich Conservation Trust for underwriting these programs. We’re also grateful to the Eddy Elementary School and Monomoy Middle School science teachers for their assistance with coordinating the programs. Additional funding for our school education programs in the Brewster elementary schools and the Monomoy Regional School District this academic year was generously provided by the Mary-Louise Eddy and Ruth N. Eddy Foundation, Cape Cod Five Charitable Foundation Trust, the Chatham Fund of the Cape Cod Community Foundation, Mass Cultural Council STARS Residencies grant program, Robert B. Our Co. Inc., W. Vernon Whiteley, Inc., and individuals from the community. And, finally, a shout out to Goose Hummock Shop in Orleans for donating eels for the Harwich field investigation! This entry was posted in Updates on May 25, 2018 by Wellfleet Bay.